I spent the majority of my life denying what was so glaringly obvious to others. Growing up, there was constant paranormal activity everywhere I lived, including some intense PK episodes during my teenage years. No matter where I went, I could feel/see/hear things and was surprised that not everyone woke up and saw ghosts standing by their bed at some point in their life. Six years ago, the spirit activity around me again became too intense to continue to ignore. I had no choice but to acknowledge, accept, embrace all it all. It took a while before I could openly call myself an Empath, then a Sensitive and now Evidential Medium. I feel deeply honored that I am able to be of service to Spirit now. I am striving constantly to be a better communicator and translator to help both those that have passed over and their loved ones. In 2016 I was chosen to have a 3 month long Advanced Mediumship class with world renown Medium Lisa Williams. I was part of a very small group who were supervised and mentored personally by Lisa. I am proud to say that I am a certified Spiritual Advisor/Medium through the LWISSD. 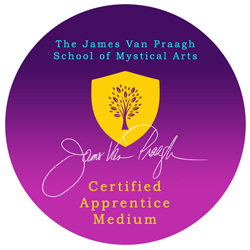 I am certified in Advanced Mediumship Level Two with another of the world's top Mediums, the amazing James Van Praagh. I refer to myself as a Spiritual Advisor. My readings are a blend of Psychic information, Mediumship, Empathic/Intuitive connection along with Oracle or Tarot cards to see what your Soul wants you know, look for or heal. I also use the cards as a visual for you to know that the information truly is coming from Spirit. If you would prefer not to hear from those on the other side, I do offer Psychic only readings. Mediumship is a way to contact your loved ones who have transitioned to the other side. I can not make anyone come through but those that do do because they are who you are supposed to hear from. They come and can help provide guidance in any area of your life. Please come in with an open heart and open mind. Your loved ones will come through and identify themselves with messages and traits that only you would know. I will always do my best to give you as much evidence about the person I am speaking to so that you know it is your loved one. I do readings via phone, Zoom, or Facebook Chat are available as well. I also do occasional psychic fairs, paranormal events and metaphysical expos.